USA: „Are We To Love Al-Qaeda Or Fear It?„. New York Times (November 5, 2016): „… trying to break the siege, with Qaeda-linked groups and those backed by the United States working together“. 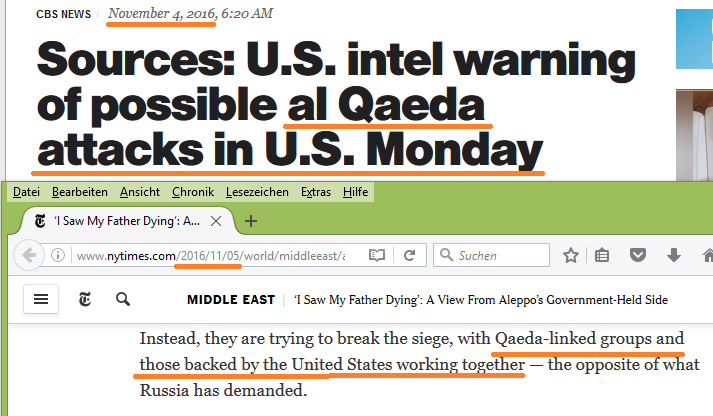 CBS News (November 4, 2016): „Sources: U.S. intel warning of possible al Qaeda attacks in US Monday“.